A quick update! There are still 2 days left in the Kickstarter. We've fully funded and unlocked the first and second Stretch Goals (Alien and Robot player characters! Psionics! Mysticism!). Thanks for all your support! Two days left in the Kickstarter, and we've just hit our second Stretch Goal! I know this forum has been a bit quiet since the Kickstarter started (I am SO not good with juggling social media), but I thank you all for your support! Heya Whittknight, I'm SO sorry for not getting back to you. Work just devoured my time, and I could never muster the energy to go through my old psd folders. Tell me if you have any trouble accessing or downloading them, I'll see what else I can do. I'm back! And exhausted! And I have a cold! But I'm back! Starting tomorrow I'll be posting stuff. Sorry for the long hiatus, folks. Believe me, I'd rather have been working on this. Hey WhittKnight, thanks for the interest. Sadly, For the mock-ups of the sheets I used Photoshop, and didn't even do it in vector or anything, so editing it will likely be a problem. As you can tell, doing page layout design stuff is not my forté. I don't even know what program to use that would generate a 'design file' (any suggestions of a good program for future attempts on my part?). I can rummage through my old stuff to find the .psd if you think it would be of use. Which one would you want, the first (one page) or the later two-page version? Hey Faskal, thanks for the feedback! Super useful as always. Glad Assessment worked out for you; confirms what I'm getting, both from my own group and others. I liked Gadgets too. They still exist! They're just in the Career Kits in the Gear. Funnily enough, since the change, my players have used MORE Gadgets from their kits than when they had free reign. Go figure. why have you decided to use this "roll+stat" instead of having a stat like "Cool" in AW and using it to Face adversity? An excellent question. I think a lot of it has to do with Dungeon World's influence on my own work, and how natural it felt to do so. Mainly, I like people to come up with inventive and 'fitting' solutions to overcome danger/adversity. It didn't feel right restricting it to a single stat because Face Adversity applies as a true catch-all for any situation; physical, mental, social, technical, etc. The old barter system was sadly one of the causes of the economy spinning out of control. Gaining Favor with a Move has been almost completely removed, and I've flattened the costs/economy in general. That said, I wanted something that scaled up and down to represent economic growth without making Favor/Debt a currency. For the moment I'll keep it in the current incarnation, but I'd be interested in hearing about any experience you have with it in play. Full character creation will indeed be updated for the next version. I've broken a LOT of stuff hahah. Interesting feedback for the character sheets. Are the cards fun/satisfying for the players? I remember having power cards in 4e was pretty satisfying in a tactile sense. I could certainly shape things so that the skills descriptions are presented in a more card-like, and that would indeed give more room for gear and faction on the sheet. Uncharted Worlds / Re: Thank you, Archangel! Hey, my pleasure. Thanks for all your playing and feedback! I've made a new attempt at a character sheet. Large version here. Thoughts/comments? - The career moves/skills are pretty verbose, especially the ones that add options to Standard Moves. 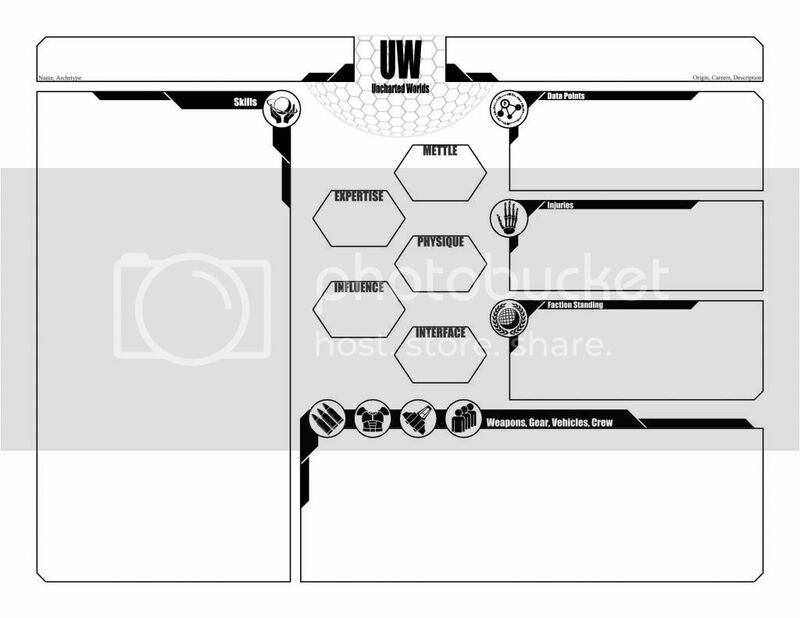 Should the character sheet have space to write out the whole skill, or just the name and a short blurb? - Not every character will have Crew or Vehicles. Should they be considered part of a larger 'equipment' section, or should Weapons, Gear, Vehicles and Crew each have their own sections? - Should I try to constrain everything to a single page, or spread it out over two? Also if a brave, skilled soul wants to try their hand at making a character sheet (Lord knows it's not my forté), I'd be super interested to see what folks can come up with. Uncharted Worlds / Re: Latest release: 0.83! The Quick start characters will indeed be pre-generated full characters. I'm still looking into how to lay out the character sheet and such. So you may have noticed in the latest rules, I removed the Artificial Origin and the Cybernetic career. To me, there are certain classes and origins that absolutely need to bend or circumvent the rules in interesting, splashy ways in order to do justice to the archetype/expectations. Robots, Cyborgs, Clones, Aliens (enlightened, warlike), Mutants, Psykers (empaths, kinetics) all fall under that category. So I've put all of those aside until I've got the basic rules solidly down and released, before I start breaking the rules in a supplement. Also, I want to make it clear that all of them are optional, their existence in the universe is to approved of by the table. Yay! Version 0.83 is up! I like it, and I'm going to use it next time. Last time I understood as a "hold +1, if you are lucky (in fiction) you can reuse it again"; I guess new way how to handle it would work. I think there is no need to dismiss idea of limited codex entries, as it says that some person can use more strategic informations then others. What I forgot last time - we found a minor problem with this though - if two characters have same/similar Codex entry and one of them finds his Codex entry outdated, second one still keeps it and in fiction it may be hard to describe how it is possible. Data Points are small but critically useful bits of information about a subject, which can be leveraged to tip the scales during a particularly tense moment. Data Points are earned by making particularly successful Assessments, from certain skills, from Acquisitions or as rewards. There are no limits to how many Data Points a character can have, but they quickly expire if they are no longer pertinent or are rendered obsolete/out-of-date. Each Data Point concerns a specific topic or subject, and can be spent to grant a +1 to a roll that directly involves or leverages the information in that Data Point. Only one Data Point can be spent per roll, no matter how many would apply. When you make an Assessment, on a 10+ you gain 3 Data Points about the subject, and on a 7-9 you gain 1 Data Point. As long as you spend part of your downtime educating yourself about a subject, Data Points associated with that subject don’t expire.